MUSEKERA, Congo — The mass graves are hidden in the darkening shade of a hard-to-reach banana plantation, high up a mountain above the cloud line, at the end of a treacherous dirt track slippery with mud and animal dung. Those who survived say they did not go to the meeting called by Rwandan soldiers. The Congolese Hutu peasants who did were brought out of the thatched-roof meeting house two by two, to be bludgeoned to death with their own hoes, picks and axes. Some 300 villagers died that morning of Oct. 20, 1996, according to the local Observation Center for Human Rights and Social Assistance. The story of the 1994 genocide of more than a half million Tutsis slaughtered by Hutus in Rwanda has been told in the world's press, in books and in movies such as "Hotel Rwanda." But the subsequent slaughter of Hutus in neighboring Congo is little known, and its perpetrators never have been brought to justice. The discovery of mass graves prompted investigations that led to a controversial U.N. report published on Oct. 1, which accuses invading Rwandan troops of killing tens of thousands of Hutus in 1996 and 1997. "There are many, many such mass graves. We've identified 30 just in this Rutshuru district, but our research indicates that this was the first massacre committed by Rwandan troops," the center's coordinator, Herve Nsabimana, said beside the banana trees. Many victims told their wives to take the youngest children and hide in the fields. Today, Musekera is a village of widows. The only man over 50 was at a nearby health center during the massacre. It was the Rwandan Tutsi soldiers, led by now-president Paul Kagame, who as rebels ended Rwanda's 1994 genocide. 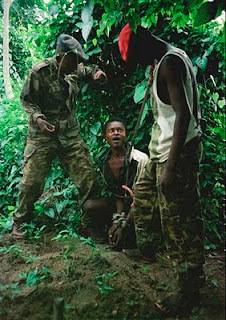 But they now are accused of vengeful massacres of Hutus when they took the war into Congo. Roberto Garreton, a Chilean lawyer who for eight years was the U.N. special rapporteur in Congo, told The Associated Press that his first report detailing massacres by Kagame's troops involved Hutus killed in Rwanda in 1994. He said the United Nations suppressed that report, apparently because of embarrassment and guilt that it did nothing to stop the genocide. The United Nations initially denied the existence of the report, which later was leaked. After the Tutsi rebels triumphed and took over Rwanda's government, Kagame became vice president and defense minister. He sent troops into Congo in 1996 - although he denied it at the time - in an invasion that led to the ouster of Congo's longtime dictator, Mobutu Sese Seko. U.N. reports in 1997 and 1998, including one by Garreton, blamed a coalition of Congolese rebel forces that Kagame later admitted were commanded by Rwandan officers for massacres of Hutus, and said they were on a scale to suggest a possible genocide. Then-U.N. Secretary-General Kofi Annan responded by asking Congo and Rwanda to investigate the allegations - basically to investigate themselves. The evidence later became too big to sweep under the carpet. In 2005, U.N. peacekeepers uncovered mass graves in east Congo of hundreds of civilians believed to have been executed by Rwandan soldiers. The discovery prompted renewed investigations that culminated in the latest U.N. report, which said the killings in Congo were so systematic that a court could consider it genocide. The report recommends that those responsible be punished but doesn't name names. Congo has said it is willing to establish a transnational court to punish those responsible. After months of denials that Rwandan troops were in Congo, Kagame took ownership of the invasion, admitting he had planned and ordered it. Among officers commanding the coalition forces was Joseph Kabila, now president of Congo. Last month, 40 Congolese police officers and a few army military investigators completed a course in forensic science that trained them to find evidence in mass graves. It was paid for by the U.S. State Department and organized by the American Bar Association. The training was led by Peruvian forensic anthropologist Jose Pablo Baraybari, who has investigated massacres in Bosnia. The trainees worked on dummies set up on mock graves, Elysee Sindayigaya said from the bar association's office in Goma, eastern Congo. "We're making representations to the government of Congo to try to get access to real mass graves, but it's very sensitive." Kagame, whose reputation is pegged to the moral high ground of having stopped Rwanda's Hutu-led genocide while U.N. peacekeepers and the international community did nothing, tried to get the latest report quashed by threatening to withdraw Rwandan troops from U.N. peacekeeping operations in several countries, including the commander of the forces in Darfur, Sudan. The report was published with some language moderated, but the reference to possible genocide remained. Its publication was delayed to include lengthy rebuttals from Rwanda and Congo. Rwanda's Foreign Minister Louise Mushikiwabo calls the report "an attempt to rewrite history" and "flawed and dangerous." Kagame has succeeded in the past in stifling similar accusations. "The question now is the same question there was then: Is there the political will to identify the killers and bring them to justice?" asked Reed Brody, a former deputy U.N. investigator who helped write the 1998 report. Human rights activists say Kagame's allies in the U.S. and British governments, which pour aid into Rwanda and have used it as a platform to dilute French influence in the region, don't want him investigated. Many fear digging further could destabilize the already volatile Central African region. Kagame was trained at the U.S. Army Command and Staff College at Fort Leavenworth, Kansas, in 1990. Once he came into power, the U.S. Special Forces trained Rwandan troops before, during and after the invasion of Congo - even as U.N. and other investigators reported their alarm at alleged atrocities by the government soldiers. Kagame has said his invasion of Congo was aimed at dismantling massive refugee camps that sheltered both Rwandan Hutu refugees and perpetrators of the genocide. At the time, reporters documented how the camps were being militarized by genocide perpetrators who used them as launch pads for cross-border raids into Rwanda. Many times, Kagame urged the United Nations to separate the armed men from the refugees and dismantle the camps. Kagame has said that in 1996 he warned the United States and the United Nations that if they would not do it, he would. A 1997 Human Rights Watch report that sought to identify commanders of the massacres said James Kabarebe, who became Rwanda's defense minister in April, was the most senior Rwandan officer in Congo during the invasion. Messages left at Rwanda's Ministry of Defense got no response to requests for a comment. Kagame has said most of those who died were genocide perpetrators. But the new U.N. report says Rwandan troops routinely invited refugees or villagers to meetings and then slaughtered them. "The extensive use of edged weapons (primarily hammers) and the apparently systematic nature of the massacres of survivors after the camps had been taken suggests that the numerous deaths cannot be attributed to the hazards of war or seen as equating to collateral damage," the report says, adding that most victims were "children, women, elderly people and the sick." Like the report, Brody noted that the impunity established then has helped fuel violence in Congo that persists to this day. Brody said his own investigation in 1997 and 1998 was obstructed by Congo's government and by the U.S. Embassy in Kinshasa, the Congolese capital. "We were asking the U.S. for information, for satellite photos we knew existed of the refugee camps. We never got a thing," he said. Requests for interviews about the role the United States military and its diplomats played during Rwanda's invasion of Congo all were referred to the U.S. State Department, which did not respond to questions. U.S. ambassador to the U.N. Susan Rice, who was assistant secretary of state for African affairs from 1997, refused a request for an interview. Brody said that while Washington probably felt tremendous guilt for not doing anything to stop the 1994 genocide and was glad that Rwanda helped rid Congo of Mobutu, "at the same time there were these thousands of cold-blooded unforgivable murders of, for the most part, unarmed people." Uncovering the graves, proving how people were killed and even perhaps identifying them could bring closure for people like Ihigihugo, one of the widows of Musekera.